Manager Craig Denton, who has transformed the fortunes of Rainworth Miners Welfare. It’s a case of mission almost accomplished for manager Craig Denton at improving Rainworth Miners Welfare. Denton’s brief was to erase the memory of a near-disastrous campaign in 2016/17 when Rainworth avoided relegation only by the skin of their teeth. With ten games remaining, his side sit as high as sixth in the Toolstation Northern Counties East League, Premier Division table. 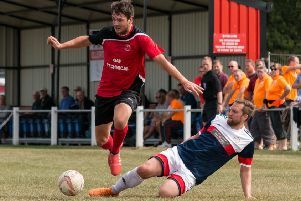 “When I took over, the focus was staying in the division and trying to finish mid-table,” said Denton, who is in his first full management post after spells as an assistant at Worksop Town and Shirebrook Town. “I was also asked to get 30 points by Christmas, and we managed 42. Overhauling Rainworth’s squad has been Denton’s biggest achievement. Only three players, goalkeeper Ben Townsend, defender Rob Ludlam and midfielder Tomas Poole, remain from last term. Denton also feels the players have responded well to the “professional environment” that he has tried to create within the club. Not only does he have an assistant but also a coach, a goalkeeping coach, a physio and even a scout in Wayne Thompson. Rainworth could yet end up with silverware because they are through to the fourth round of the league cup. But they also have unfinished business to see to in a derby with champions-elect AFC Mansfield next month. They led AFC 2-0 in the first fixture, only to be pegged back to 2-2 by an 88th minute equaliser. “Yes, we are looking forward to that one,” said Denton.